Karuṇā (in both Sanskrit and Pali) is generally translated as compassion. 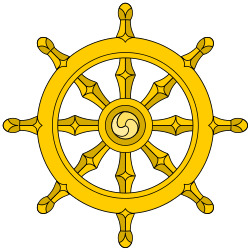 It is part of the spiritual path of both Buddhism and Jainism. The Pali commentaries distinguish between karuṇā and mettā in the following complementary manner: Karuna is the desire to remove harm and suffering (ahita-dukkha-apanaya-kāmatā) from others; while mettā is the desire to bring about the well-being and happiness (hita-sukha-upanaya-kāmatā) of others. In the Pali Canon, buddhas are also described as choosing to teach "out of compassion for beings." ↑ Regarding the Sanskrit word, see Monier-Williams (1899), p. 255, entry for "karuṇā" (retrieved at http://www.sanskrit-lexicon.uni-koeln.de/scans/MWScan/MWScanpdf/mw0255-karaTa.pdf), where the noun form of the word is defined as "pity, compassion". For the Pali word, see Rhys, Davids & Stede (1921–25), p. 197, entry for "Karuṇā" (retrieved at http://dsal.uchicago.edu/cgi-bin/philologic/getobject.pl?c.1:1:356.pali), where it is defined as "pity, compassion". In general, contemporary scholars, translators and interpreters have consistently translated the word as "compassion," not "pity." This can be seen, for instance, in (listed chronologically) Warder (1970/2004, p. 95), Ñāṇamoli (Buddhaghosa & Ñāṇamoli, 1975/1991, Vsm. IX.77ff., pp. 306ff. ), Saddhatissa (1985/1994, p. 3, Sn 3.39), Thanissaro (1994, AN 3.65), Salzberg (1995, pp. 102ff. ), Gethin (1998, p. 187), and Bodhi (2000, SN 41.7, p. 1325). ↑ Gethin (1998), pp.186-187; and, Rhys Davids & Stede, op. cit. ↑ For instance, in the Kālāmā Sutta (AN 3.65), the Buddha speaks of all Noble Disciples (ariya-savaka) developing the brahmaviharas (Thanissaro, 1994). ↑ Kālāmā Sutta (AN 3.65), trans. Thanissaro (1994). The "four directions" refer to east, south, west and north. ↑ AN 3.65 (Thanissaro, 1994). In regards to in which heavenly realm a frequent karuṇā dweller will be reborn, AN 4.125 (Thanissaro, 2006) identifies it as the realm of radiant (abhassara) devas, whose lifespans last two eons. ↑ Sn-A 128 (cited by Rhys Davids & Stede, 1921–25, op. cit. ); see also, BDEA & BuddhaNet (n.d.). Similarly, the post-canonical Visuddhimagga, chapter IX, vv. 105-109, provides further elucidation, such as with a metaphor describing mettā as a mother's wish for her (healthy) child to grow up and karuṇā as a mother's wish for her sick child to get well (Buddhaghosa & Nanamoli, 1975/99, pp. 313-4). ↑ In Pali, sattesu ... kāruññataṃ paṭicca, found in DN 3.6 (regarding Vipassī Buddha), MN 26.21 and SN 6.1 (see, e.g., Bodhi, 2000, pp. 233, 430, n. 362; and Thanissaro, 1997). It is worthwhile noting as well that several other references in the Pali Canon to the Buddha's acting out of "compassion" are not related directly to karuṇā but to the synonymous anukampā (which is also defined as "mercy" in Rhys Davids & Stede, 1921-25, p. 34). ↑ Gethin (1999), p. 228. ↑ Shah (n.d.). Regarding samvara, see "Release from karmas". From a comparative religion perspective, cf. Buddhism's four brahmavihara; for instance, maitri is often identified as a Sanskrit correlate of the Pali mettā (Rhys Davids & Stede, 1921-5, p. 540, entry for "Mettā," retrieved at http://dsal.uchicago.edu/cgi-bin/philologic/getobject.pl?c.3:1:177.pali). Shah, Pravin K. (n.d.). Nine Tattvas (Principles). Retrieved from "Harvard U." at http://www.fas.harvard.edu/~pluralsm/affiliates/jainism/jainedu/9tattva.htm. Thanissaro Bhikkhu (trans.) (1994). Kalama Sutta: To the Kalamas (AN 3.65). Retrieved 2008-05-10 from "Access to Insight" at http://www.accesstoinsight.org/tipitaka/an/an03/an03.065.than.html.